The Chateau de la Croë is located in Cap d’Antibes, a very prestigious part of the French Riviera between Nice and Cannes. It stands next to the villa Eilenroc, built in 1867 by Charles Garnier, designer of the Paris Opera. Eilenroc has been home to such figures as Belgian king Leopold II, Egyptian king Farouk, Aristotle Onassis and Greta Garbo. Association with a famous name can raise the value of a property by up to 20 percent. The history of the Chateau de la Croë is also full of recognisable names and memorable events. It was built in 1927 in strict Victorian style for an English aristocrat, named Sir William Pomeroy Burton president of the Associated Newspapers limited. The architect of the magnificent demeure was called Armand Albert Rateau, who built the property within 7 hectares of land, which stretches right down to the sea. The domain also includes vast annexes destined for staff, which totals to over 3000m². Sir William Pomery Burton was not a stranger to the French Riviera, as he was also the owner of the Villa Barbara, on the Cap Martin. In 1938, the Duke of Windsor, the former King Edward VIII of Great Britain, and his wife became its owners. After falling in love with the twice-divorced Wallace Simpson, Edward VIII abdicated the throne in 1936 and left England in order to marry her. When she moved to the rented Chateau, the Duchess spent huge sums to recreate there the conditions her husband had become accustomed to in the royal palace. The most expensive furniture, silver and porcelain were imported from England. The layout of the 12-bedroom villa was substantially altered, although the Duchess left the gold-plated, swan-shaped bathtub intact. Owners since then have refitted the villa to their taste and, at some point, the swan tub fell victim to those changing tastes. The Duke and Duchess of Windsor held sumptuous receptions at the chateau, hosting royalty and the political elite, including Winston Churchill. In time, the couple grew bored with the residence, however, and moved to Paris. In 1952, the chateau was bought by Greek shipbuilding magnate Stavros Niarkos. The villa is composed of, apart from the vast reception rooms on the ground floor, eight master suites with as many bathrooms, and six domestic bedrooms. In time of its great splendour, the domain employed 33 employees. Round about 1970, the domain suffered from a great fire which burnt both the house and the trees surrounding it. After three decades of abandonment, the Chateau de la Croë is currently undertaking a superb refurbishment, restoring it back to its original beauty and greatness. This article has been created for the history of the Chateau. It is not a real estate listing! 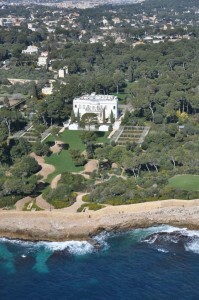 For a selection of properties for rent on the Cap d’Antibes (please click on the highlighted link).